There is a line that divides soccer clubs in the United States between the haves; Oregon and Washington premier clubs around the PacNW, and the have-nots; the grassroots soccer clubs. The Premier Soccer Club will charge upwards of $5000 just for joining the soccer club and then the thousands extra for travel, leaving most families with only the option of joining a soccer club that has to do things like hold a car wash or a raffle to raise funds. But there are better options that the international organization Just 4 Keepers can provide to help small clubs not only save money but make money. Get a supplier for soccer balls, uniforms, and other equipment and save up to 50% through the Just 4 Keepers network. There are many suppliers to choose from, so be careful, and trust Just 4 Keepers, we work with only the best. Let’s face it, children grow quickly and spending up to $300 for the kit and tracksuit is ridiculous!! Just 4 Keepers has many contacts for uniform suppliers in Pakistan, where uniforms are made and can set your soccer club up with quality gear. Create an online store with J4K. Because Just 4 Keepers is trusted around the world, our SEO get’s many soccer coaches to the very top of the Google search page extremely fast! If a club were to go out and start their own store it would take less than a month to start earning big bucks. Host a goalkeeper academy at your club. NorTac Soccer club of Tacoma, Washington is an example of how a soccer club can partner with Just 4 Keepers to both have professional goalie training and save families money. By hosting an academy a soccer club not only benefits from its goalies getting better, but also because of the expertise of the soccer coaches in the Just 4 Keepers network, the soccer club receives FREE coaching clinics, as well as other extended learning for soccer coaches without spending thousands of families hard working money to see coaches drift off at a conference because of no sleep. Host a soccer camp with Just 4 Keepers. Just 4 Keepers Washington had over 200 soccer players attend camps around the Seattle area in 2018. One thing is true, every camp we run, the kids love it. At a soccer camp there will be upwards of 60 kids and have about 1 or 2 goalkeepers. However in the Just 4 Keepers camps that J4K Washington ran this summer with Tacoma Stars’ Alex Megson, and Seattle Sounders’ James Riley and Amadou Sanyang there were at minimum 22 goalkeepers registered. 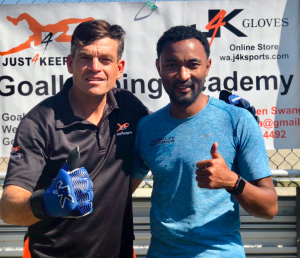 The bottom line is that no goalkeeper academy has made the impact on the West Coast like Just 4 Keepers Washington has, and for Stephen Swanger, the coaching director of J4K in the PacNW, the goal is to partner with as many clubs as possible. A rising tide lifts all ships, so why not join the tide? JR7 Coaching with James Riley joined J4K with Stephen Swanger for a striker keeper clinic.